Theologically, Basil was a supporter of the Nicene faction of the church, in opposition to Arianism. He was also known for his care of the poor and underprivileged. Basil established guidelines for monastic life which focus on community life, liturgical prayer, and manual labor. He is remembered as a father of communal monasticism in Eastern Christianity. 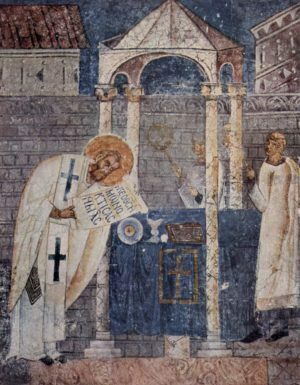 ~Image: Fresco of Basil the Great in the cathedral of Ohrid. The saint is shown consecrating the Gifts during the Divine Liturgy which bears his name.